Qarabag insist Champions League opponents Celtic are favourites to win Wednesday's first leg in Glasgow. Gurban Gurbanov, the head coach of the Azerbaijani champions, says a change in playing style favours the hosts. Expressing concerns that his squad are tired following their European travels, he added: "We're very happy to play against such a big club. "Celtic are strong in every position but we will stop them individually and positionally." Speaking ahead of the first leg of the third qualifying round, Celtic boss Ronny Deila said the supporters can strike fear into the hearts of Champions League opponents. However, Gurbanov says his players will be able to handle the atmosphere in Glasgow. "The players won't be nervous by the big crowd because they have experience and will enjoy the big atmosphere," he said. "Celtic changed their playing style last year so it will be difficult for us. We've watched all their games they've played and we're playing a team with a strong will to win. "Qarabag have made some changes since last year and some players still don't understand one another very well. "Fatigue will affect the players which is why Celtic have an advantage in the first leg." 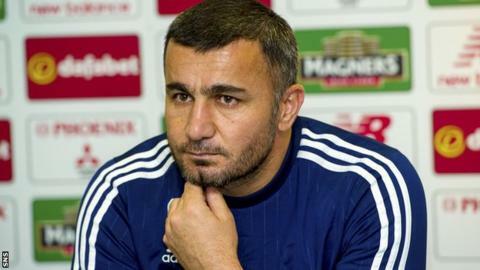 Gurbanov believes his side will have to combat a number of dangers in Glasgow but is confident Qarabag also pose a threat. "Each Celtic player is dangerous: Biton, captain Brown, Armstrong, Johansen; but each player presents danger," he said. "Reynaldo is one of our most important players but it's a team game."